It seems that the season of bicycle touring is in full swing. 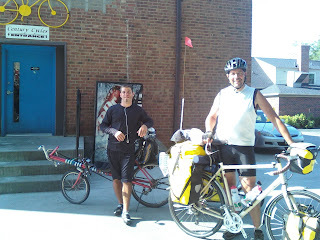 We had the privilege of seeing two groups of bicycling tourists go through Rocky River on Saturday. Both were heading west and it definitely made some of us at the shop a little jealous! Thanks to Phil and Lauren, and Gerry and Kris for saying hello! 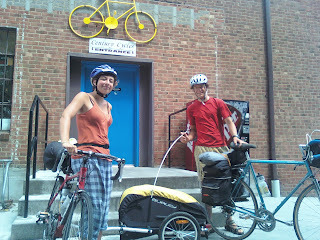 just wanted to add that Phil and Laura's blog is http://www.agreenamerica.wordpress.com. While we are riding we are seeking out people making more sustainable lifestyle decisions.